With a daughter who has been riding for 30 years, a "horse show dad" learns a thing or two along the way about what is important in a tack trunk. It must be strong, have plenty of room for everything needed at a horse show, be well organized, secure, easy to move and, of course, it must be attractive. After all, it will contain thousands of dollars worth of valuable equipment and you want it to project a professional image. That describes a Blackberry Hollow Tack Trunk, Tack Locker or Tack Box. 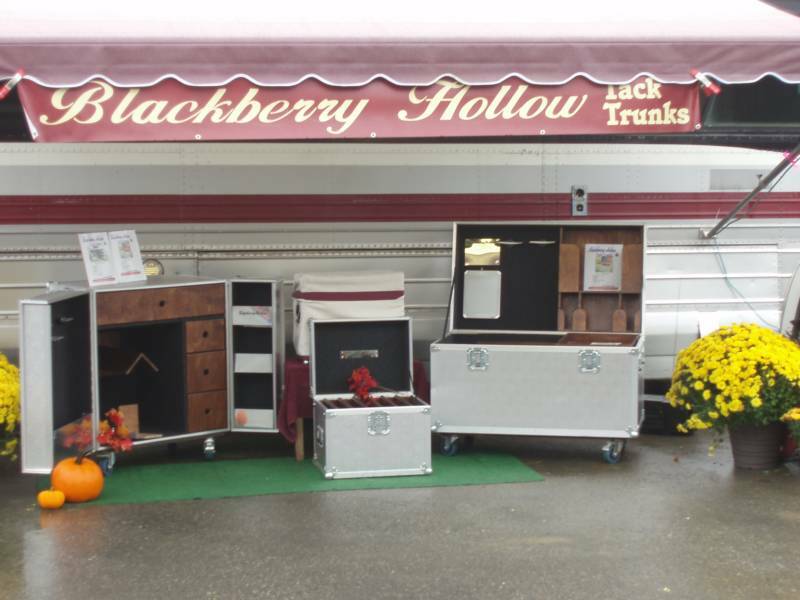 At Blackberry Hollow Tack Trunks we have incorporated the culmination of a quarter of a century of horse show experience into our tack trunks that is all of the above AND is affordable. With no "middleman" to boost up the price you deal directly with the manufacturer for "significant" savings. With a clean exterior without pop rivets and bolts and a luxurious interior with carpeting, fine woodwork and polished metal this is a tack trunk you can be justifiably proud of. We think that your tack trunk/locker should look as good a few years down the road as it does the day you bought it. So we are always looking for ways to facilitate this. To that end we have introduced stainless steel fittings which will not rust , dull or tarnish. As well, we now apply a "protective coating" that will ensure that, with a minimum of upkeep, your tack locker/trunk will remain clean and shinny for years to come. Our tack lockers/boxes are designed to not only last a lifetime but stay looking good as well. But some of our competitors have cut corners to provide a cheaper product. The use of lighter materials, smaller connectors and latches, smaller hinges and different construction techniques results in a product that will, in our opinion, not stand up as well. A quick comparison will quickly point that out. Copyright 2011: Blackberry Hollow. Tack Box. All rights reserved.